Royersford "Type E" Pillow Blocks are the most widely used of the "E" Series due to the variety of mounting methods. They are available in both 2-bolt base and 4 bolt base styles. 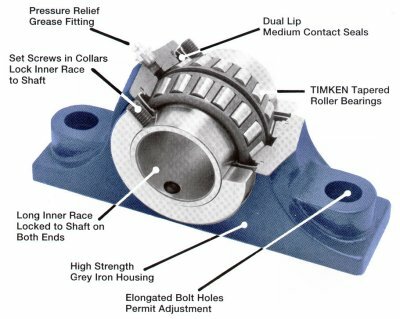 All units are supplied with Timken® tapered roller bearings, dual locking collars and Royersford's exclusive dual lip, medium contact seals. Type E units provide combination of high radial and thrust loads as well as ease of installation and positive locking to the shaft.